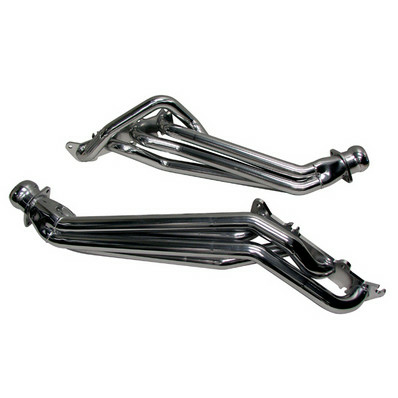 * Stainless Steel Finish ALL New 2011-2016 Mustang 5.0 GT Full Length Headers & High Flow X Pipe From BBK Now Available. Take a first look at the all new 2011 Ford Mustang GT 5.0 BBK 1-3/4 Full Length Headers and high flow 2-3/4 X pipe. (available separately). BBK R&D department developed these headers with one thing in mind  Getting even more horsepower and torque out of the all new 2011-2013 5.0 liter Mustang that is already putting out nearly twice the horsepower of its 5.0 predecessor! This all new rugged BBK header design is constructed with 1-3/4 CNC Mandrel-Bent tubing and solid 3/8 laser cut exhaust flanges. Initial testing is showing gains of around 30 plus horsepower with the high flow catted X pipe  and BBK will have an off road version available for even more horsepower gains. All exhaust header kits include new gaskets and hardware. PLEASE NOTE: 2015-16 Mustang GT models, must use with direct fit Mid Pipes Part #1816 or #18160 and also MUST USE Part #16332 2015 O2 extension Harnesses & hardware kit Please note: *BBK full length headers require a BBK short X pipe or H pipe to complete installation to the cat-back exhaust system. No one else can Stack up to the bold clean styling of our aftermarket Billet / Stainless Steel Dress Ups, Street / Strip / Racing Suspension and Performance Parts for your American Muscle Car! Fits these Vehicles: 2011 2012 2013 2014 2015 2016 V8 GT 5.0L Coyote 4V Mustang Steeda Roush & Saleen Vehicles. Made in the USA!